A still image from Matt Bailey’s video of a mob of kangaroos hopping through Deakin. A Facebook video of kangaroos bounding past a Deakin office has reached three million views in just two weeks and is leading the ‘mob’ of local videos which have gone viral in the last two years. Animals appear to be high in the popularity stakes of Canberra area videos taking off on social media with a soccer-playing kangaroo, drug-detecting alpacas and swooping magpies also among the most-watched videos since 2016. However, they were outclassed in the viewer stakes by an Australia Day 2016 video of a Canberra guy zooming around on a clothesline waterslide invented by some of his mates. On the more serious side, a dash-cam video of some scary driving on the Monaro Highway has also attracted strong interest, while tugging on the heartstrings is a video of a premature baby boy fighting for his life while back home firefighters battle to save his family’s home. 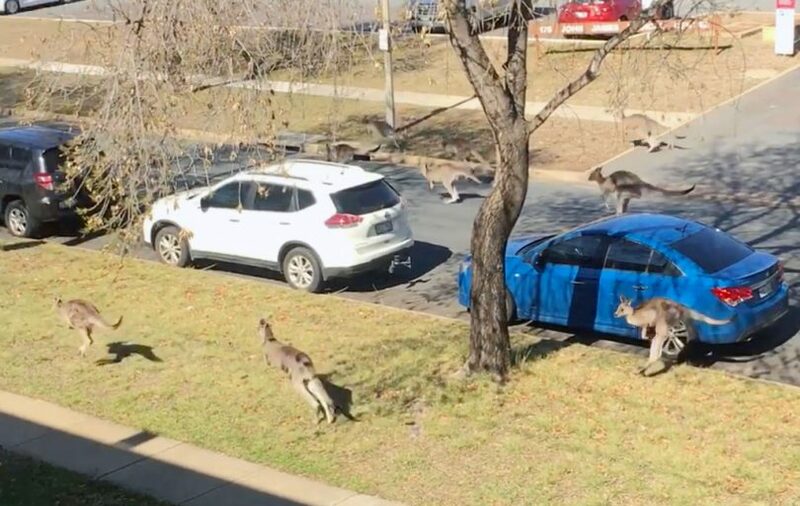 Canberran Matt Bailey said he is very surprised that the video he took of about 20 kangaroos hopping at speed past his Deakin workplace has now reached three million views – and counting. “I only ever put the video on Facebook for my friends to see. I then had a couple of friends ask if I could make it public so they could share with friends overseas. From that, it took off,” Matt told The RiotACT. He said the reaction to his video has been “ridiculous” but it hasn’t impacted his life much. If you haven’t already seen it, below is Matt’s kangaroo video with its funny commentary, shared from his Facebook site. When you work in Deakin, and look out your window….May as well use it – head on over to my photography page www.facebook.com/mattbaileyimages ?? Several of the other viral videos created in Canberra and surrounding areas in the last two years are shared below. Given how many videos are shared every day, this list is by no means exhaustive. Add to it in the comments if you know of any other recent local videos which have gone viral. In true Aussie style, some Canberra guys decided to celebrate Australia Day in 2016 by transforming a backyard into a water park by connecting a hose and a handle on a rope to a Hills Hoist. The fun waterslide antics video is shared from the nine.com.au Facebook site below. In late June, a rogue kangaroo was videoed making a cameo appearance at a Canberra women’s premier league match in Deakin – stopping the match for 20 minutes and at one stage trying to fill in as goalkeeper. The video (shown below) was posted by Capital Football and to date has received more than 690,000 views. An ACT Policing video produced for April Fools’ Day 2016 hit the funny bone for many viewers delighted by the idea of woolly alpacas being sent in to sniff out drugs. The video stars six unruly white alpacas and a deadpan presenter who seeks to convince us that her rigorously trained charges will provide good backup for when “all our canines are deployed”. The ‘Alpaca Drug Detection Pilot Program’ video posted to Facebook (and shown below) has to date attracted around 303,000 views. Grace Stevens from Cooma posted dash-cam footage to Facebook of a frighteningly close call when a ute is faced with an overtaking car travelling right into its path on the Monaro Highway. The incident captured dramatically on camera took place on July 31 and shows the ute swerving off the road to narrowly avoid the oncoming car which has crossed into its lane. Grace posted the footage (seen below) to her Facebook site and to date it has attracted 150,000 views. A video featuring a pair of ANU scientists wearing awful jumpers and being swooped by magpies as they ride a tandem bike across campus attracted strong interest after it was created in October 2016. To date, the Facebook video posted by ANU (and seen below), has attracted 42,000 views – and has no doubt resonated strongly with people who know what it’s like to duck their way through the magpie-swooping season. The magpies of ANU have gained campus icon status for their infamous swooping. How will they fare against a tandem bike commandeered by two brave academics in terrible jumpers? And why are these angry birds so… angry? Posted less than 10 days ago, a moving video told from the point of view of a premature baby boy fighting for his life seeks to honour the firefighters who fought to protect the family’s South Coast home and save their “new beginning”. The touching video (shown below) was posted by Jemma Paewhenua to her Facebook site and has already been viewed by 41,000 people. This is a message of gratitude to everyone who has helped during the bushfires. There’s a special message in here for pilot Allan Tull (the pilot who tragically lost his life), so PLEASE SHARE with everyone as we’re hoping it will reach his family ?? Do you know of any other videos taken in Canberra or surrounds which have gone viral in the last couple of years? If so, let us know about them and share a link in the comments below. Would you eat a Canberra kangaroo?